Fast shipping and very very Good Quality ever. Like New. Just as described! Tnx. 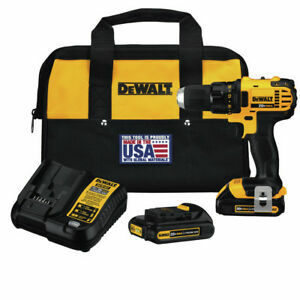 Excellent cordless drill, good grip and lots of features that assist in various projects (multiple speed settings, flashlight, things you hope you have when you're working in poor light or with multiple materials). Keeps a firm grip on various bits even when drilling through hard surfaces, and the batteries slot in nicely and keep out of the way enough while working. The batteries also hold a lot of juice; I've been working for two hours before with this drill using just one battery, and recharging the difference all that working time took out of it was maybe a minute. Good heft, easy to grip and use, handy case all make for a good package deal. We'll see how this one holds out but I predict this will stay in good working condition for years. This drill looks brand new and performs as new. I highly recommend this to anyone looking for one. I've been using a corded drill in my house for all my projects, but not anymore. This drill is also really light and gets the job done. Most drills with impact hammer features are much heavier. This one is very light with great speed control in both forward and reverse. Comfortable sized grip. Just a good drill motor. Lightweight with great features. Two batteries are great, never to run out of juice and two speed is just what I wanted.